This is a Guild Wars 2 fanfiction I have written for the competition run by the YouTuber WoodenPotatoes. The topic was “Living World Season 3”. In light of the recent Heart of Thorns expansion, we had to write something that could happen in the Living World Season 3. You can find the Reddit thread with all the entries here. Warning: There are obviously spoilers for the Heart of Thorns expansion and all previous story. This piece takes place soon after the defeat of the Elder Dragon of Plants and the Mind, Mordremoth. I tried my best to make it so that this story could be applied to any GW2 player character which has been through the story, not merely my main character – a male Asura Mesmer. There is another writing piece that I have done, titled “Advance”, set a few months after this one. Please note that all images are not created by me. They are screenshots I took of the Inner Chamber in Guild Wars 2. Thank you for your time reading this. Please leave a comment. I’m always looking to improve my writing. My entourage had significantly decreased in size by the time I reached Tarir, as most of the members of what was left of the once mighty Pact had to once again return to the battlefront along with some of our allies. Just as with Zhaitan’s minions, the Mordrem seemed intent to stick around and go down fighting. Yet, there was still a sizeable crowd behind me – and another forming ahead of me in Tarir, this one mostly consisting of Exalted. As I approached, Luminate – their leader – floated forwards. “Yes,” I replied, “I travelled into Mordremoth’s mind and fought him. Mordremoth is no more.” This statement was once again met with cries of victory, admiration and awe. But my eyes fell to the ground. 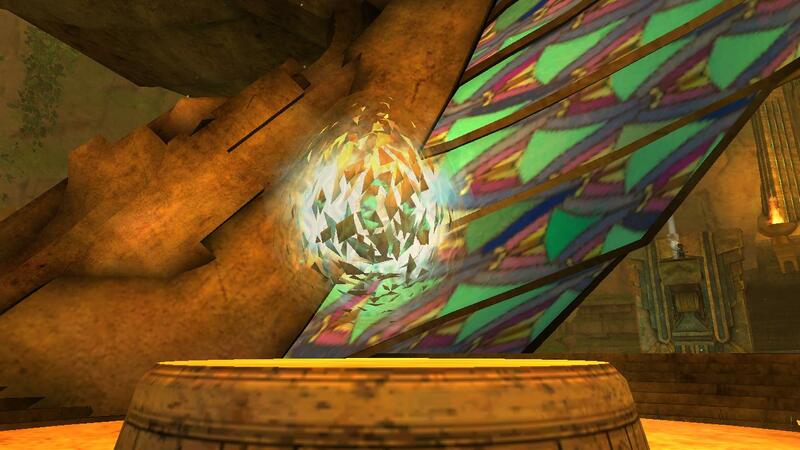 By the time I had finished, Ruka had led me to the portal to the Inner Chamber, Glint’s egg within. “What you say rings true, Egg Bearer. But we must fight. Though peace would be far preferable to violence, we cannot take it to the extreme – as Ventari, whom your Priory Scholars tell me of, did – and merely let the dragons destroy us.” Ruka paused to let me think and to pick up an object from a nearby surface. “Now, as soon as Kiru reported the wave of lay energy released from Mordremoth’s position and that a large quantity of it had been absorbed into Tarir, I was tasked with finding where it had gone, whether a specific location or it had merely been absorbed into the gold of our city. I discovered that it had been absorbed by the egg. I shall demonstrate with this device Kiru fashioned for me some time ago. Similar to his larger apparatus, a blue dot appearing on the gold indicates the presence of ley-energy. This one, however, is directional. When I pointed it at the egg, I discovered it to be significantly larger than before.” He lifted it up and pointed it in the direction of the Inner Chamber. “See here, i-” he stopped. “It was a circle before, but now it seems to be stretched slightly…” Ruka looked at me. “In your direction. Come,” a tone of urgency entered his voice, “we must enter the chamber.” He hurried through the portal, closely followed by me. “Is it hatching?” I asked with more excitement than I had expected to show in my voice. I ran through the crystal clear water and up the golden stairs. Indeed, the egg was rapidly hopping up and down in the air. I approached it and the mid-air hops increased in their frequency and size. Nervous, I backed away – towards the edge of the platform again. But the bouncy egg didn’t calm. I turned around, intent on walking back to Ruka – who was at the bottom of the stairs – when something seemed to grab me. I struggled against this nonphysical force with all my might, but I was compelled to walk towards the egg. The egg was now hopping around faster than those children in Lion’s Arch had been after eating all that candy corn. Then it stopped. My arm lifted itself. “Egg Bearer, what are you doing?” a puzzled Exalted voice came from behind me. I couldn’t respond. Against my will, I leant forward to place my hand on the egg. As my hand neared it, the air around me seemed to hum and vibrate. Then I touched it and whiteness filled my sight. My first thought was that the egg was showing me another vision, as it had before, but once I gained my bearings, I found that I was in a physical space; a near-empty landscape. The ground was made of opaque white crystal, stretching off in all directions as far as I could see, although the ground was not perfectly smooth. The sky, if any, was pure white too. It was too surreal to be real. I then realised that it was not a landscape, but a mindscape – such as the one I had seen when in Mordremoth’s mind. This one, however, was not made of plants. It was hard to tell where obstacles and objects were, as there were no shadows due to the non-directional light in this mindscape. Yet, just as I was thinking this, a light source seemed to manifest in the sky above. The new shadows now gave the irregular and unidentifiable landscape some depth. I stood in silence. Nothing happened. I stepped forward when suddenly colour burst forth from beneath my feet. Gold spread out and the ground began to form into distinct shapes and objects. Further from me, the ground sunk down and water appeared. Beyond this, green walls rose up. The familiar environment now seemed to be made of smooth crystal, even the water. I was back in the chamber, my hand upon the egg, which was now stationary. I lowered my hand, then took a step back. Another ripple spread from my foot, the chamber shifting to be the outside of Tarir, all my friends and allies present – but merely as crystal statues. As I looked at each one – their eyes drawing me in one at a time – my memories of them seemed reflected in the eyes. Braham, Marjory, Canach and so on. Caithe was last. I shuddered and fell to my hands and knees as I broke eye contact with the Crystal Caithe, the resulting shockwave of brown crystal giving me a feeling of nausea. Something was forming again. I looked up and yelped in fright, grabbing thin air where my weapon should have been. I then scrambled back as Mordremoth’s mental manifestation loomed over me, my memories of the Elder Dragon racing through my mind. Yet this statue, too, sunk back into the ground. One by one friends, allies, enemies and acquaintances formed, summoned their memories forth, then sunk back into the ever changing landscape. For each individual, or sometimes groups, the areas I associated with them, or had seen them in, formed from the crystal. Several times I tried shouting, asking if anyone was there, asking for it to stop, trying to figure out what was going on. There was no response. I tried running from the statues. I tried damaging them. I tried not looking into their eyes. Nothing worked. My eyes always moved themselves onto the statues’. With each statue, my energy seemed to diminish. Soon enough, I was on my side with only enough energy to observe. That is until a final white statue rose from the ground. It formed a large crystalline dragon, one which I had not seen before, made of the same white of the nondescript landscape. I prepared for the draining sensation once again. I looked at its eyes of my own volition, hoping to get this over with faster. But I had no memories of it. This time my memories of research done with the Pact, all the myths and legends I had been bombarded with by the Priory, every folklore and tale I had heard or read, came rushing through my mind. Blackness seeped into the corners of my vision. I prepared for the worst, silently berating myself for not having been strong enough to fight whatever this was. Then it moved, opening its mouth and breathing out a pillar of sparkling yellow flame towards me. I was engulfed in flame, yet not harmed. I felt energy returning to my body, and I sat bolt upright. I then stood up. I realised at that moment how much I took the ability to perform everyday movements for granted. The white world faded to full whiteness, then I felt myself falling to the ground, hitting my head. Once the ringing in my head stopped, and my vision cleared, I saw Ruka’s ‘face’ hovering above me.